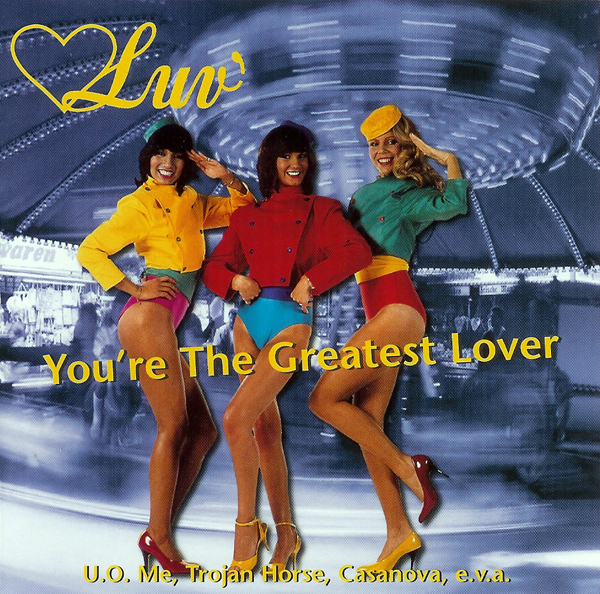 In 1993, Luv' enjoyed a cheerful reunion and exposure in the media (see previous Chapter). Their "Luv' Gold" compilation sold quite well. 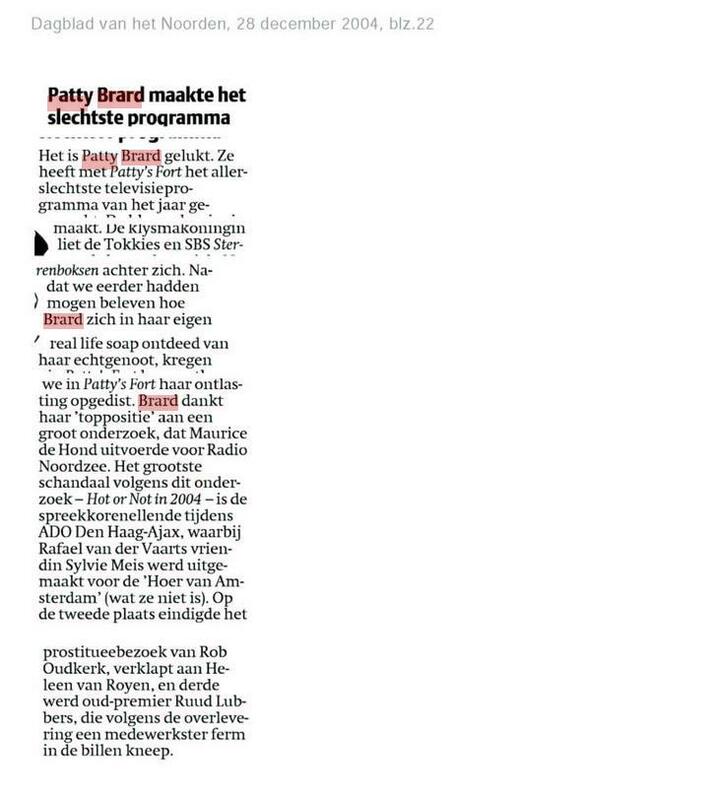 The only dark cloud on the horizon was Patty Brard's bankruptcy. 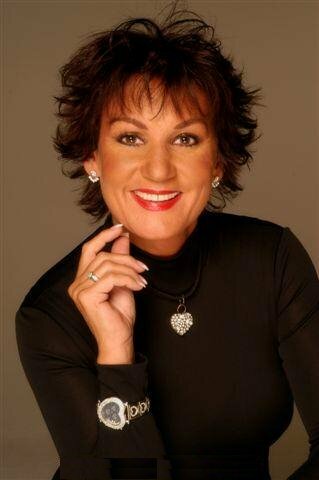 But the Indo-Dutch entertainer was a survivor and in 1994 she was back on television as a presenter. The group performed occasionally on stage until 1996 and then disbanded. Soon after this umpteenth break-up, tensions between Patty and José Hoebee appeared. Their feud was covered by celebrity gossip magazines. Patty wanted to make up with her former colleague. Accompanied by a camera crew, she met José in a parking garage with a bouquet of roses to bury the hatchet. But José refused to be filmed although she was not opposed to make peace in private. A reconciliation seemed impossible. 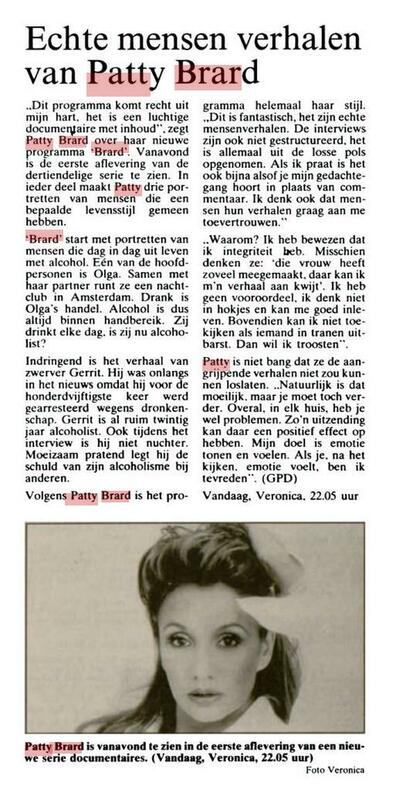 In the late 1990s and at the turn of the 21st century, Patty was a familiar face on Veronica channel with programs such as "Brard gaat extreem", "Brard", "Veronica Goes Gay", "Patty", "Patty gaat extreem" and "Absolutely Patty". 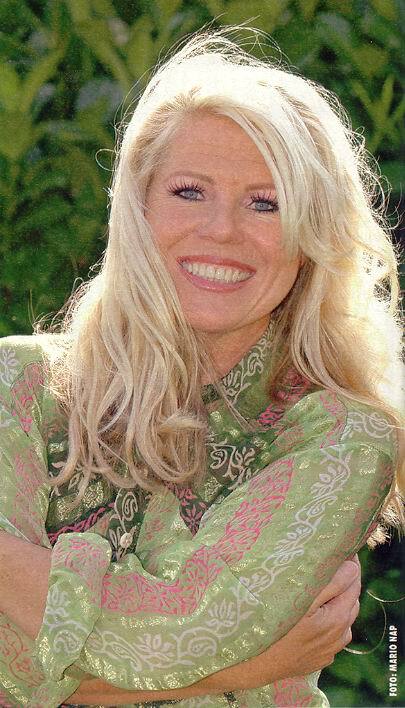 2001 saw her involvement in reality television when she hosted the third season of Holland's "Big Brother". Inspired by the success of "The Osbournes" on MTV, the reality series "Patty's Posse" aired on Yorin in 2003 and featured her domestic life, her friends and her family (her daughter Priscilla and her third husband René Muthert). The show was high in the ratings and each episode averaged 850.000 viewers. During the craze for "Patty's Posse", La Brard wanted to take advantage of the nostalgia for Luv' and formed her own girl group called "Enuv'" with two ex-members of "De Frogettes" Anouskha de Wolff and Marian van Noort. 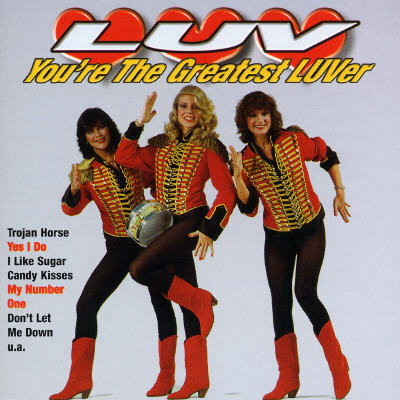 The ladies performed cover versions of hits from the 1970s and 1980s (Luv', Dolly Dots, Vanessa...). The group rapidly disbanded. 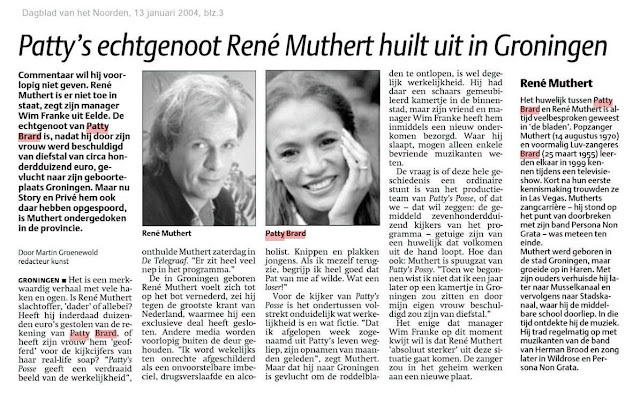 Thanks to her popularity, Dutch journalist Pieter Ploeg wrote her biography ("De Naakte Waarheid: The Naked Truth") which was published in 2003. In the autumn of 2004, she starred in "Patty's Fort", a Yorin program with other celebrities (including Marga Scheide) as they were having a therapy which consisted of fasting, yoga and meditation. 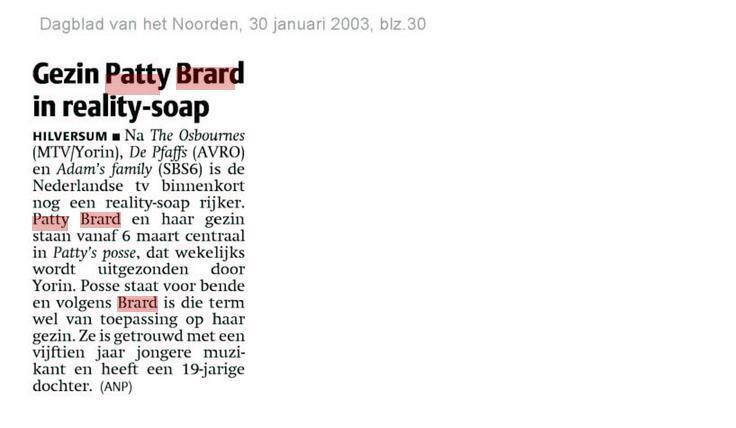 It caused a sensation and was unfairly known as the "Klysma show" because of a segment showing Miss Brard having an enema. 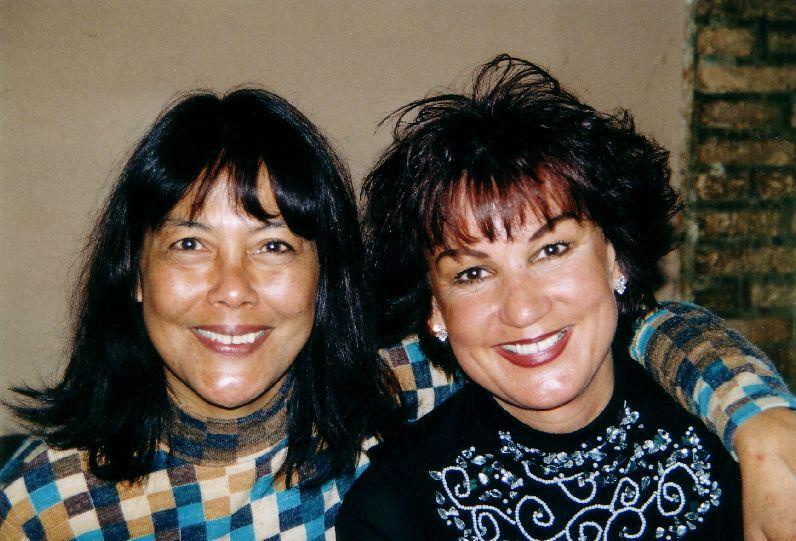 During the broadcast of "Patty's Fort", the larger-than-life entertainer was devastated when her brother Robert passed away at age 43 due to a kidney disease. 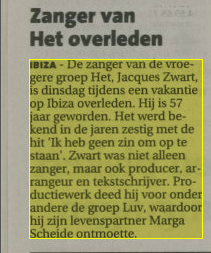 As for Marga, her world was tumbling down when her partner, record producer Jacques Zwart died of a heart attack in Ibiza in April 2003. It took her months to get over this sudden loss. 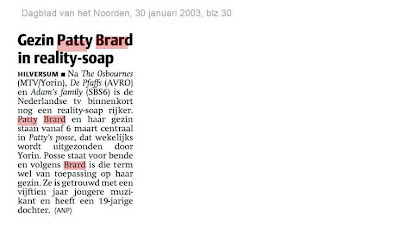 She continued the online music store "www.selectcd.nl" launched by Zwart in 2001. 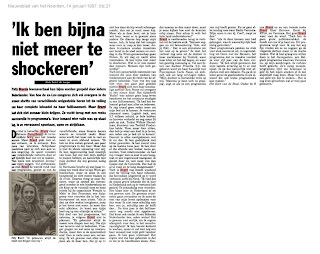 In 2004, she set up another online service specialized in the merchandising of Dutch celebrities (www.selectidols.com). These companies were short-lived and by 2007 they were dissolved. José Hoebee who retired from show business in the 1990s was the owner of a video rental shop (The Movie Store) for one year and a half in Best, a village near Eindhoven, NL. She sold her business in the summer of 2003. 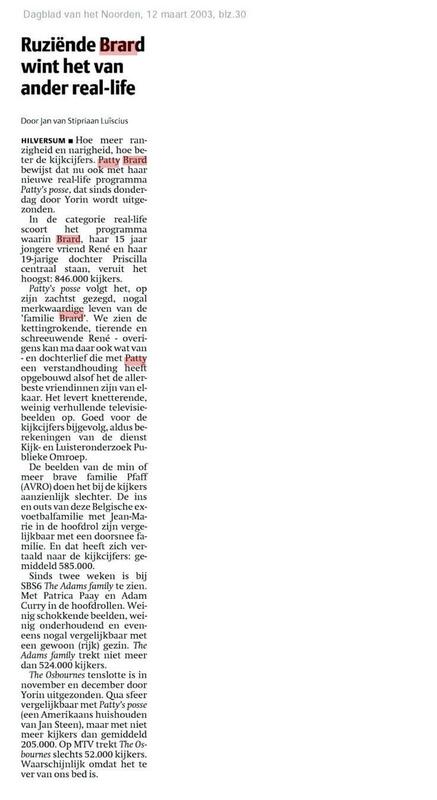 With the help from Corry Konings (a popular singer in the Netherlands) and her booking agency (CK Produkties), José decided to resurrect her singing career. She also started to write a weekly column on the now-defunct "Muziekmaken.nl" site. 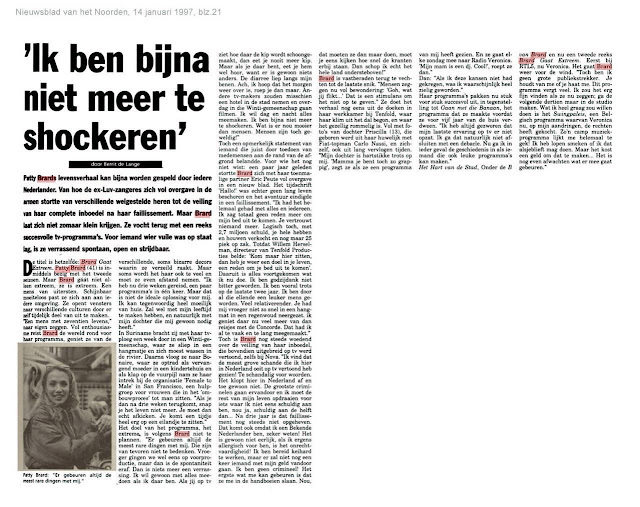 She told anecdotes about the glorious years with Luv', expressed her opinion on Dutch entertainment and replied to Patty's attacks in the press. In early 2004, she recorded under the pseudonym "Stuff" a dance oriented cover version of a Four Tops classic hit ("Walk Away René") downloadable on internet. Moreover, she sang two tracks as a guest artist on a tribute album to Doris Day (Marjan Berger meets Doris Day). In the fall of 2004, José hosted a music talent show (Tijd Voor Muziek) on a Dutch local channel (VSM TV). Her husband, Will Hoebee collaborated on the production of this program. On December 13. 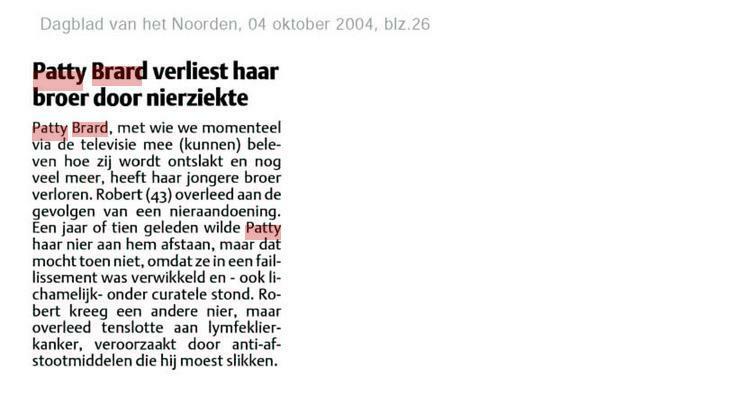 2004, the singer was a witness at Bonnie St. Claire's wedding. 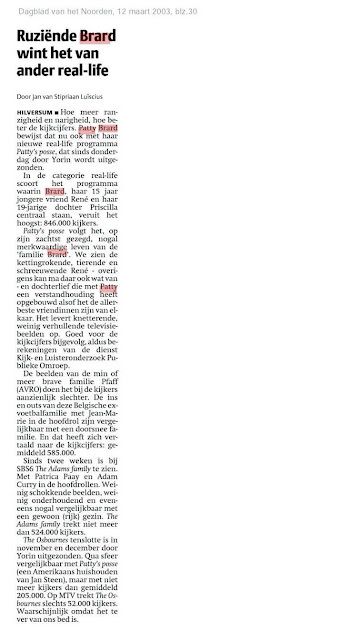 The ceremony was broadcast live on SBS 6's "Shownieuws". José performing "Who's sorry now"
The quarrel between Patty and José didn't stop the fans from enjoying projects which focused on the legendary female pop trio. Budget-priced compilations came out during this period. 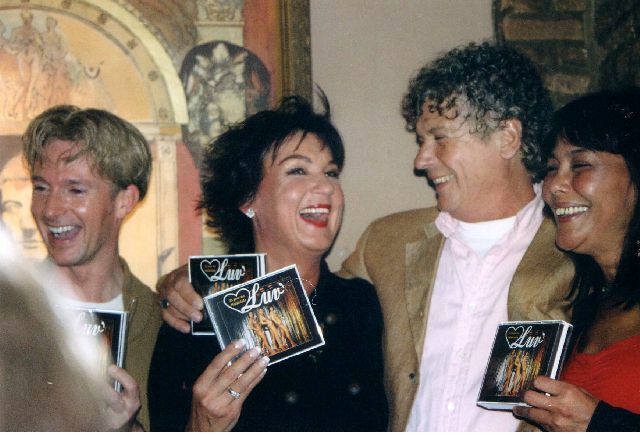 In September 2001, René Moonen launched Luv's official fansite by courtesy of Marga and José. In April 2003, the first fan club meeting took place with José and Ria Thielsch (member of the 1980-1981 line-up). Marga was invited but because of Jacques' death she could not come. 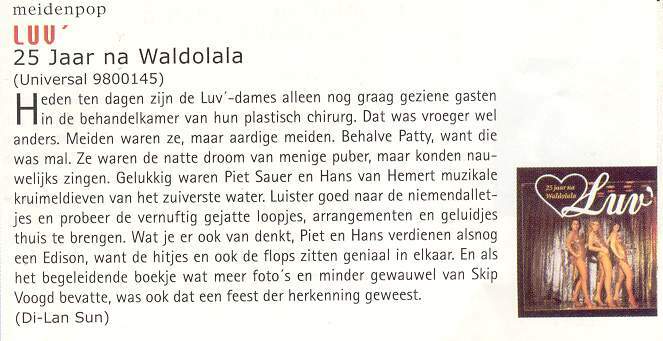 Six months later, Universal Music (in association with René Moonen, Hans van Hemert Productions and CNR) released the double CD "25 Jaar Na Waldolala" to celebrate the 25th anniversary of Luv's breakthrough. 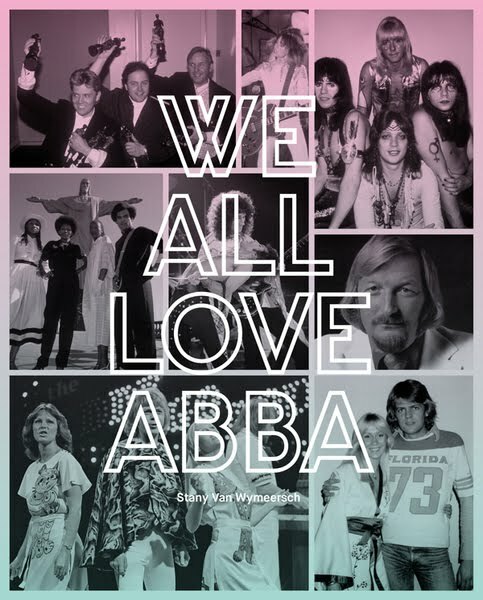 The compilation included smash hits, Spanish versions of four songs, previously unreleased tracks on CD and solo recordings by José and Marga. Will Hoebee, José, Ria Thielsch and Hans van Hemert attended the album release party. 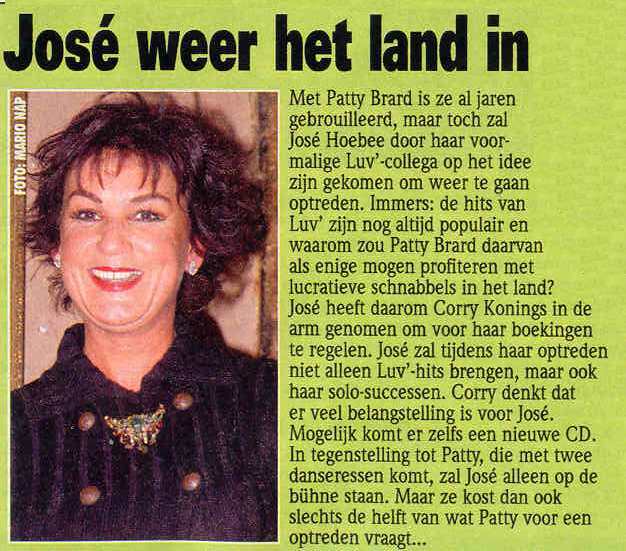 Patty was not involved in this project as she was then in conflict with the producers and her former colleagues. A DVD was supposed to come out simultaneously with the double CD. However, Miss Brard vetoed this video collection because of her right of publicity. 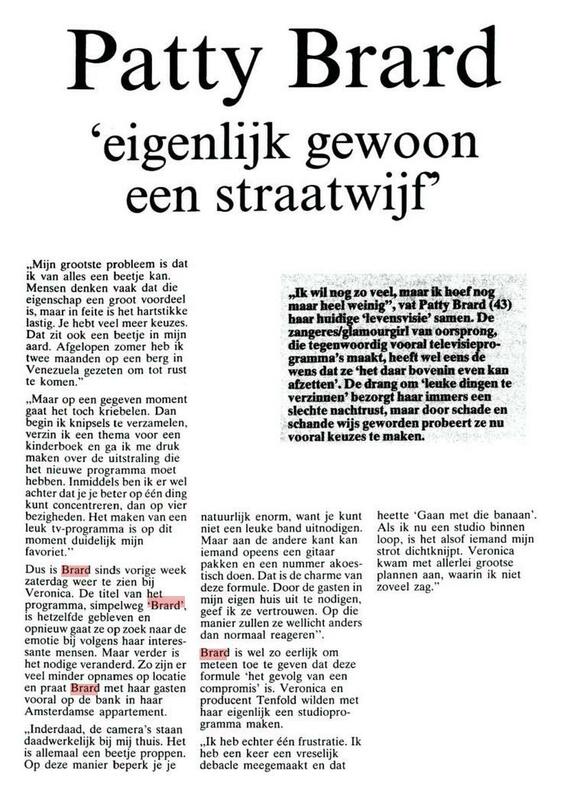 In November 2004, a meeting between René Moonen, the three original Luv' ladies and Van Hemert was held in secret in order to be reconciled. The trio was considering a comeback. But a few days later, Patty appeared on "Jensen! 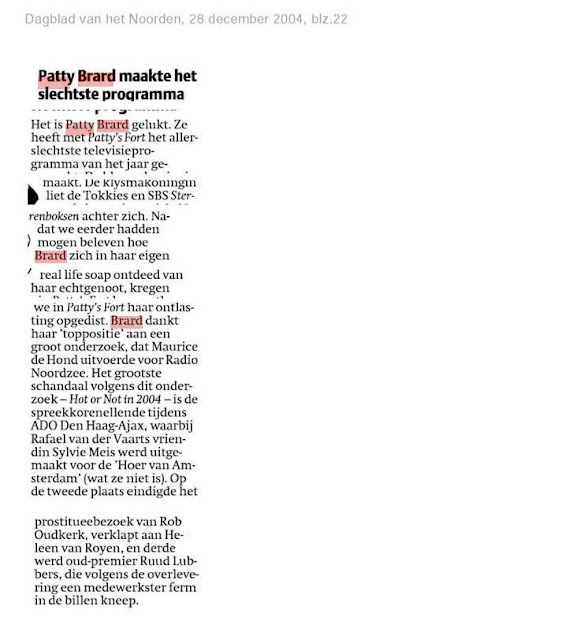 ", a late-night talk show on RTL 5. The enfant terrible of Luv' was a bit drunk and insulted José. The efforts to plan a revival suddenly collapsed....Fortunately, the following year, happy news overshadowed this sad event. Tracks 1 to 6 taken from "With Luv'"
Tracks 7 to 11 taken from "Lots Of Luv'"
Tracks 12 to 21 taken from "True Luv'"